But in today’s busy restaurants and kitchens, this rarely happens for chefs and their guests. This is the idea behind the James Beard Celebrity Chef Tour Dinner: giving chefs and guests an opportunity to connect in a meaningful way about a shared passion — food and drink. Once again the James Beard Foundation has chosen Larkspur Events and Dining as the location for Vail’s Celebrity Chef Tour Dinner on April 1. Six of Colorado’s most up-and-coming chefs, teaming up with a mixologist and wine makers, will gather for a night of food, wine, and libations. Each chef will prepare a course paired with a specific wine. The dinner is culinary-driven and ingredient focused, ie., it’s more about the chefs than the wines. Guests will have the unique opportunity to talk with chefs about their backgrounds and sources of inspiration, and maybe even learn a few tricks of the trade. There’s not just one chef. Instead, multiple chefs will come together to create one incredible dining experience. The dinner will be hosted by Thomas Salamunovich of Larkspur Events and Dining in Vail village. Other celebrity chefs will include: Paula Turner of Larkspur; Steven Redzikowski and Bryan Dayton of Oak & Acorn; Paul Anders of Sweet Basil; Jennifer Jasinski of Bistro Vendome; Troy Guard of TAG; and Mark Metzger of St. Julien Hotel & Spa. Past celebrity chefs say they enjoy sharing the kitchen for an evening with other chefs they know and admire. They’ll often use the event as an opportunity to try out new dishes or a different spin on a signature dish. There’s more on the “drinks menu” than wine. An outstanding mixologist will provide “a twist” on the traditional food and wine dinner. Guests will be introduced to a variety of craft cocktails served during the cocktail reception, where each chef will present a special hors d’oeuvre. You’ll leave wanting more, and guess what? You can have it. The Celebrity Chef Tour Dinner will take place during this year’s Taste of Vail, ranked as one of the country’s best food and wine festivals. Most guests — and celebrity chefs — stick around to attend other Taste of Vail events, which span the weekend of March 30 through April 3. If you’re into food and wine, this is an event you won’t want to miss. The festival showcases more than 30 of Vail’s finest chefs and restaurateurs, along with nearly 50 of the countries’ top wineries. For more info: tasteofvail.com. You’re sharing the love. 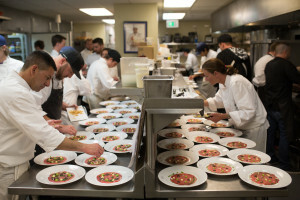 Purveyors donate most of the food served at the Celebrity Chef Dinner, while the chefs donate their time and some additional hard-to-find ingredients. Proceeds from the Celebrity Chef Tour Dinner benefit the James Beard Foundation, a national not-for-profit with a mission “to celebrate, nurture, and honor America’s diverse culinary heritage through programs that educate and inspire.” To learn more: jamesbeard.org. Tickets for the Celebrity Chef Tour Dinner are available for $195 per person. To purchase tickets, go to jamesbeard.eventbrite.com or call 970-754-8070.